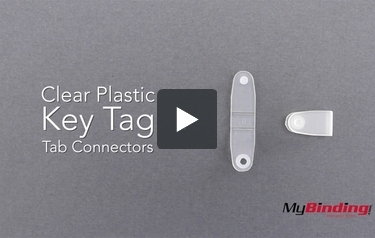 These clear plastic key tag tab connectors allow you to quickly and easily customize your key ring for easy identification. These connectors measure 1-3/8" x 5/8" in size and are packaged in bags of 100. Check them out today. These are awesome if they fit. The hole must be 3/16" for it to fit correctly. My first project had 1/8" hole and these were too big for it. Neither this description nor the description on the keyring blanks I used had the hole size. Was just as described, and exactly what I wanted. Same thing everyone else has, just cheeper. Review by Lee B.
I scoured the internet looking for the cheapest price on these. MyBinding.com had the best price by a decent margin. Easy to Click-on and Light-Weight for Shipping Review by Marcia J.
I really like these plastic tabs for a number of reasons. First, they are more affordable than the metal split-rings I was using for the same purpose. Second, they are easy to use -- a simple click to attach them and they stay attached. Third, they are light-weight, so the cost of mailing them is less than if I used the metal split-rings. Here is how I use this product: I laminate my business card (using the luggage lamination sleeves with a slot on the end). Then I use the plastic tag tab to connect my laminated business card to my promotional items. The product works great! These are Clear Plastic Key Tag Tab Connectors! If you are looking to make something like a keychain, this tiny piece of plastic will be very helpful. When connecting one stick it through a hole at the top of your project and close it up while trapping a split ring between. To give an idea of what size holes it will fit into, here it fits snuggly in a badge holder. Using a standard hole punch it will be a little loose, but perfectly functional. For a tighter fitting hole, you can use the Akiles Eyelet Punch and it should be a pretty perfect fit—but not when you are actually using the eyelets. You can use it to thread chains and cords through as well. It may look like it won’t hold together, but after many attempts to pull it apart it had me beat. When it’s on, it’s not going anywhere. Now you can attach your project, or a pass to a zipper or anything you like—even make your own key chain. Thank you for your question. We do ship internationally. If you put items in your cart and view the cart, you can enter your country and postal code to get the shipping cost. For international orders we only accept PayPal or wire transfer (there is a fee for wire transfers) as payment. Please contact our customer service department directly if you need assistance placing the order and we would be happy to help. The Plastic Key Tag Tabs that we carry are currently only available in clear.